The hot water boilers I have worked on were mostly the small residential type and they were all gas fired. All of them were of the cast iron sectional type with insulation and decorative lagging for a jacket. This is because back in the 1960s there was a big push in New York City to get away from the dirty burning oil fired boilers, and get people to switch to clean burning natural gas boilers. Back then oil-fired boilers were big and so were their oil tanks. Once people made the switch to gas they found they had so much extra space in the house they could turn the old "Boiler Room" into another family room. This is because the new boilers were so small and add to this that the oil tank was not needed anymore either. In the photo above I have replaced all of the zone valves on the hot water circuits and added in a 5th zone to conserve energy and reduce fuel costs. I switched from solenoid valves, which tend to stick to Honeywell motorized ball valves. Each zone is a loop of pipe that feeds heat to an apartment in the building. In this house all the apartments were lined with tube and fin baseboard heaters. When a thermostat calls for heat to a zone the valve for that zone gets opened and the main circulation pump starts. The water gets pumped through the zone and convection air currents across the fins in the baseboard heaters transfer the heat to the space. This causes the water in the loop to cool. All zones go back into the boiler through a common return line. An aquastat on the boiler monitors the water temperature. Once the water temperature drops below the set point the boiler burner is ignited to reheat the water for the zone loops. It is important to note in these systems that the thermostats in the individual apartments only open the zone valves and turn on the water pump if it is not running. 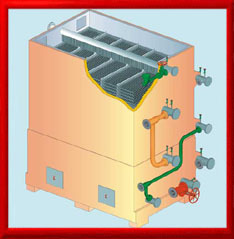 The aquastat on the boiler controls the firing of the boiler. In a properly insulated home these systems are very effective, compact, and efficient. If you ever have to drain your system for repairs upon refilling it with water you first have to open up all the zone valves and then you have to go to the loop at the highest elevation in relation to the boiler and open bleeder valves to allow the air in the lines to get pushed out by the water as the system refills back to the top again. As it fills you will hear the whoosh of the air coming out of the bleeder valves. Close them off once you see a steady trickle of water coming out of them. Most of these systems are built with copper sweat tubing and fittings because of coppers high thermal transfer efficiency. The most common breakdowns you will encounter on these systems are stuck zone valves and failed circulation pump shaft seals. Many contractors who install these systems in new house will install cheap unitary design solenoid valves once these stick. You have to cut them out and throw them away. Buy a modular design zone valve as a replacement instead. These types of valves allow you to disassemble them while the valve body stays in the line, and you can change the seats and gaskets or other wear parts and reassemble back into to the system. A shaft seal failure is easy to see. You will have water all over the boiler room floor. Most circulation pumps have a red painted motor and pump body. The seal assembly consists of an ultra hard ceramic ring usually white and the seal consists of a mating spring-loaded carbon ring. These seals are concentric with the pump shaft. As the seal spins a small amount of water acts as lubricant to reduce the friction of the carbon ring against the ceramic ring. As the carbon wears the spring maintains the pressure to keep the seal, but eventually after several years the seals wear out. These seals are sold as an assembly at most plumbing supply stores and are very common. To replace the seal assembly remove the pump motor and then the seal assembly from the pump housing. Transfer the pump impeller to the new seal assembly and reassemble the whole thing and you are done.